Cambridge IGCSE Geography Revision Guide has been designed specifically to meet the requirements of Cambridge IGCSE Geography syllabus (0460). 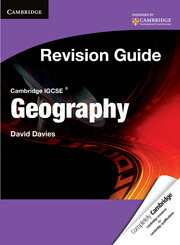 It has been written to help students prepare for the Cambridge IGCSE Geography examination. The book instills confidence by improving the students' understanding of key concepts and adds focus to their revision. Example questions and answers to highlight common mistakes or misunderstandings. Chapter containing geographical skills required, different types of questions and techniques for writing answers to facilitate and focus students’ revision efforts.